The next meeting wil be led by Jean-François. My name is Onyeka, and I’ll be leading the next OAPWS meeting on Wednesday March 28 at 7:00 PM. The meeting will be held from 7:00-8:30 PM at 40 Templeton Avenue on the University of Ottawa campus. The entrance to the building is on Templeton just off of King Edward Avenue. We can meet in the lobby of the building before 7:00. 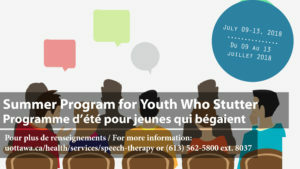 The Ottawa Support Group for People Who Stutter will meet this week Wednesday, March 17th, 7:00 – 8:30pm. We now meet every 1st and 3rd Wednesday of every month. 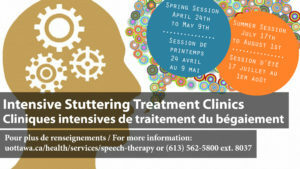 This will be a special session led by Dr. Pat Roberts, who is a professor of Speech Pathology at the University of Ottawa. For this meeting and this meeting only we will change venue. We will meet at the University of Ottawa main campus, at Fauteux Hall, 57 Louis-Pasteur Private, Ottawa, ON K1N 6N5, room 235. This is the building of the Faculty of Law, right in the middle of the University campus, across the lawn from the main library. The back of the building overlooks King Edward Avenue. Arrows will be placed around the building to point the way to the meeting room. The room is up a very short flight of stairs from the main lobby. If in doubt, maps of campus are easy to find on-line.